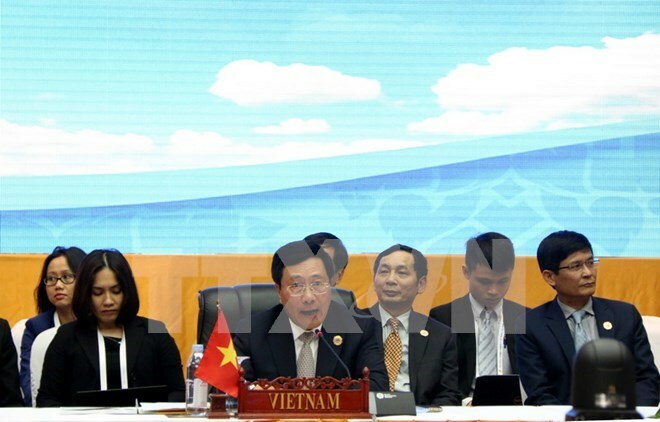 Vientiane (VNA) – Deputy Prime Minister and Foreign Minister Pham Binh Minh had separate meetings with foreign ministers from other countries on the margins of the 49th ASEAN Foreign Ministers’ Meeting (AMM 49) in Laos. At a meeting with Thailand’s Minister of Foreign Affairs Don Pramudwinai on July 25, the diplomats gave positive evaluations on the new progress in the two countries’ strategic partnership and agreed to convene a joint committee meeting at the end of 2016 to discuss concrete measures to improve cooperation efficiency. Deputy PM Pham Binh Minh recalled July 7 and 9 when Vietnamese fishing boats were shot on Thailand’s sea area. He asked Thailand to coordinate with Vietnam to investigate and handle the cases in line with the law of the two countries, as well as of the international community, so that similar cases would not happen. The Thai FM affirmed to work with Vietnam to deal with this matter. The same day, Deputy PM Pham Binh Minh met with Secretary of the Philippine Department of Foreign Affairs Perfecto Yasay, during which the two sides agreed to promote the comprehensive and win-win cooperation between Vietnam and the Philippines within the framework of their strategic partnership. They agreed to continue supporting each other since Vietnam will host the Asia-Pacific Economic Cooperation (APEC) forum and the Philippines will become Chair of ASEAN in 2017. They pledged to strengthen coordination at the ASEAN mechanism, in addition to regional and international forums to promote peace, cooperation and development. Earlier on July 24, Deputy PM Pham Binh Minh had a bilateral meeting with Minister of Foreign Affairs of the Republic of Korea (RoK) Yun Byung-se after attending the 6th Mekong-Republic of Korea (RoK) Foreign Ministers’ Meeting. The two ministers expressed their satisfaction at the wide-and-deep development in the two countries’ strategic cooperative partnership and agreed to work together closely to propel bilateral collaboration forward, including the effective implementation of the contents of cooperation discussed by Prime Minister Nguyen Xuan Phuc and President Park Geun-hye on the sidelines of the recent Asia-Europe Meeting (ASEM) Summit in Mongolia. Deputy PM Minh suggested both nations enact measures to forge economic links and proposed that the RoK support Vietnam to implement the Vietnam-RoK Free Trade Agreement effectively, as well as encourage Korean enterprises to make long-term investment, provide technical transfer, and develop support industry in Vietnam . He asked the RoK to help Vietnam gain access to preferential loans of the International Development Association (IDA) after 2018. The two sides agreed to enhance coordination at the ASEAN-RoK cooperation mechanism, the East Asia Summit, and at regional and international forums. At a meeting between Deputy PM Minh and Australian Minister of Foreign Affairs Julie Bishop, the two sides expressed their delight at the remarkable strides in various fields in the two countries’ comprehensive partnership, and agreed to maximise efforts to bring the bilateral relations to a new height. Deputy PM Minh proposed Australia continues facilitating the imports of Vietnamese farm produce and seafood. The Australian side agreed to speed up risk management procedures so that Vietnamese dragon fruits could be sold in the market. Julie Bishop said Australia hopes to assist Vietnam with human resources development. She stressed that Vietnam is the priority of Australia in educational partnerships in the region. She asserted that Australia supports Vietnam in spending financial resources to push economic restructuring and sustainable development forward. She will persuade Australia’s relevant agencies to support Vietnam at the World Bank’s sessions on cooperation and development.